Dirades leucocera Hampson, 1891, Illustr. typical Specimens Lepid. Het. Colln Br. Mus. Diagnosis and taxonomic notes. Males of this and the next species are very similar, with a strong, dark brown, hill-like marking on the forewing dorsum, just distad of centre, and fine, oblique, gently curved antemedials and postmedials more anteriorly on the otherwise uniformly medium brown wing. On the hindwing the postmedial is fine, pale, varying from gentle curvature to being almost straight with a more violet blue tinge to the area basal to the postmedial. The female has the postmedial angled centrally just obtuse of right-angled, lacking the longitudinal pale streak of mutans, but having the ground colour of the wing distinctly paler than the ground distal to the posterior side of the postmedial angle. The male genitalia typically have the aedeagus scobinate subapically and terminating in a weak, hooked spine, absent in the Bornean specimen which has a pair of lateral patches of scobination: the uncus is shorter in the Bornean male. 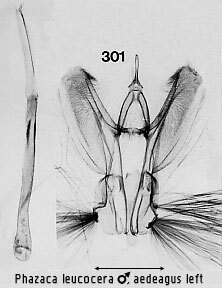 In the female the base of the ductus and ostium is shaped as in mutans, but the ovipositor lobes are narrower, and the bursa has a large, sun-like signum with a broad, disc-shaped central plate. Geographical range. Sri Lanka, ?S. India, Hong Kong (A. Galsworthy pers. comm. ), Borneo, Solomon Is. Habitat preference. A male has been taken on Pulo Laut, a low-lying island at the south of Borneo. A female is the only specimen from recent surveys, taken in dry heath forest at Telisai in the lowlands of Brunei. Biology. Bell (MS) reared a species he identified as leucocera in S. India, The larva is subcylindrical, narrowing over the thoracic segments. The head is heart- shaped, black, with the labrum and base of the antenna white. The body is ochreous green with a broad black dorsal band extending in spurs down to each spiracle. The larvae lie on the underside of old leaves but feed only on the young ones. Pupation is on the soil surface in an ovoid cocoon of silk incorporating particles of earth. The host-plant is Canthium (Plectronia) in the Rubiaceae.